I’m happy to report that I’m over at Kelly L. McKenzie’s blog blathering espousing on all things American. You may remember recently that I hosted Kelly here in order to learn the surprising truth about Canada. 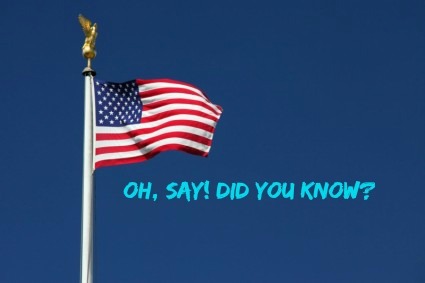 Well, turns out that even though Canadians profess to know 8 gazillion times more about America than Americans know about Canada, those Canucks still don’t know it all! Yes, please pop over to Just Typikel and see how I answered Kelly’s pressing questions about America. You’ll come out educated, entertained, and enlightened. That was hilarious, Katy! I commented over there though. 🙂 I felt quite entertained. Actually that is exactly what I needed right now. I have been so far behind with work that I haven’t gotten out in a while and look at what I am missing! Hope you had a wonderful start to the New Year! Hi Michelle, Thanks! I see all your great foodie posts around the blogosphere/social media. Hope some of that work that’s been taking your time is at least cooking related! Glad you came by for a much-needed laugh.